I traveled the globe collecting microscopic plankton and even in the most remote place found micro-degraded plastic in all of my samples,which was only the pollution she could visible through the microscope. 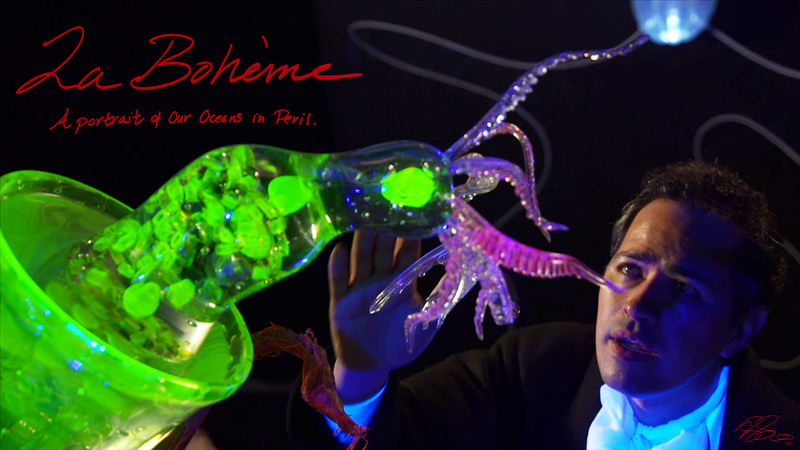 “La Bohème: Portrait of Our Oceans in Peril” is a series of luminescent glass sculptures and operatic performances which are an homage to impending peril of microscopic plankton which play a crucial role in regulating our planet’s atmosphere by producing half of the world’s oxygen, sequestering CO2 and composing the foundation of the ocean’s food chain. I am showing the Complete Version of LA Boheme a Portrait of Today’s Oceans in Peril for the first time in the States! IF YOU FEEL MOVED IN ANY WAY BY THIS PLEASE SIGN THE PETITION BELOW: Save the High Seas! So we can all breath!